Joseph Chivayo (30) likes to keep busy. 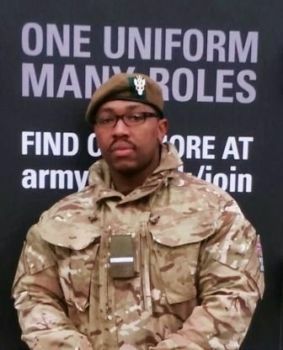 As well as working as a Personal Trainer and running a small business analysis and consultancy service on strategy and corporate governance he still finds time to volunteer with the Army Cadets, with the British Red Cross, the British Legion and as a School Governor. But above all Joseph lists his most important role as “husband and father”. I joined the ACF as I was brought up with a clear appreciation of the discipline, professionalism and focus found in wearing the uniform. I hadn’t been a cadet, so for me it’s a fresh start with new experiences and exciting opportunities. I enjoy the physical and mental stimulation and I'm sure the ACF can provide an environment that not only develops my brain through learning new skills but also ensures I can remain physically fit. Having been promoted to Adult Under Officer in the ACF, I am excited about taking more leadership responsibilities and leading fellow adult volunteers as well as cadets. I’ve seen cadets join with little confidence, poor communication skills and a limited outlook on life but gradually change their perspective and role within their schools, communities, and within the county. The ACF fosters a culture of selflessness, tolerance, humility and service and these are values that cut through barriers within communities and bring cohesion. For me the ACF also provides an opportunity to develop myself and learn new skills. I danced with the idea of joining the Army as an officer and I know the ACF is nothing like the Army but it’s giving me an inside knowledge and a taste of what to expect. My background is Tourism and Hospitality; I have a Masters in Hospitality Management, experience lecturing in business management, tourism and hospitality and hope to further my studies with a PhD scholarship in organisational strategy or entrepreneurship. For now I’m looking forward to seeing what I can learn from the organisation’s experts while considering the opportunities available. One of the great things about volunteering with the ACF is that it gives you a platform to explore and challenge yourself with various activities. I’ve already taken courses in First Aid, Public Relations, Brass Instrument Playing and the Introduction to DofE course to become a Duke of Edinburgh’s Award leader. So it’s give and take and I’m excited to see how my career progresses over the years.